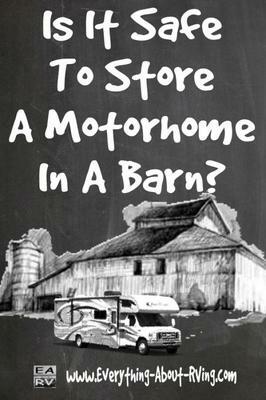 Is It Safe To Store A Motorhome In A Barn? We are planning to purchase a used diesel class A coach and will want to keep it in a heated Pole Barn. Will the diesel fumes permeate through the coach? With 80 plus gallons of fuel in a tank, I am fearful that the inside of the coach will smell over time which will cause my wife to never enter the coach thus our new planned purchase will be a disaster. ANSWER: Hi Jerry, the simple answer to your questions is No; you should not have a buildup of diesel fumes when storing your Motorhome in a barn. If you end up smelling diesel fumes it means that you have a problem in the fuel system in your Motorhome, such as a leak, etc. The one thing I would suggest is that you turn off the propane at the tank in the Motorhome when storing it inside. Actually there are going to be a lot of Class A Motorhome owners who will be quite jealous of your setup. Every RVers dream is to have a covered building to store their RVs in when they are not using them. Congratulations on your new RV and welcome to the wonderful world of RVing. Comments for Is It Safe To Store A Motorhome In A Barn? Safe to live in RV in a pole barn? Hi, we are in the process of building out a portion of our pole barn as a home. We have built it (or are in the process of) to also store our camper and truck. I want to be sure if we live there in the 30' 5th wheel, what we need to do to be safe from carbon monoxide if we need to run the heater and water heater. Right now we hope to be in the house before it gets too cold here in WI, but if we have to run the heat, how safe is that to do? Notes: The pole barn will probably not be insulated until later, so it's more of a shelter from wind and rain (and snow). Therefore, it won't be completely 'tight'. We also have 2 windows in that area that can be opened to let bad air out. Any input? I've seen posts elsewhere that talk about venting the heat and H2o heater to the outside but not sure how to do that? Storing an RV in a heated barn (you must live "up North") presents several obvious advantages. However, as a previos commenter suggested, the wee beasties seek warmth in the winter as well. If you do not have mud dauber screens over your furnace and water heater outlets, I recommend you purchase and install them. In our shop last winter we had to take apart an RV furnace in order to remove acorns and nesting materials! An alternative to the screens would be to take some painter's tape - you know, that blue tape that barely sticks - and cover the outlets. Just remember to remove the tape before you fire up the furnace or water heater. Many RVers also place a vapor barrier under the tires. Webmaster & "Doer of Many Things"
Don't forget about Rodent control though. The warmth will be enticing to the little varmits. Comment From RVing Al: Thanks Diane that is a great point!!! We actually have some articles about Rodent control. Read the answer I gave to the question below. How Do I Get Rid Of The Mice In My RV?